Even if you’re aware that glaciers are melting and sea levels are climbing, these facts can be difficult to connect with on an emotional level. A sound artist at the University of Virginia is hoping to change that by turning scientific data into music, and, well, the result is pretty damn cool. “We’re trying to create art, but it also has other possibilities,” Matthew Burtner, who presented his work on glacial sonification at the American Geophysical Union meeting last week, told Earther. Those possibilities include giving scientists new tools to communicate and do research with, and adding to the larger societal conversation on climate change. For Burtner, glaciers have always been a subject close to home. Born and raised in small Alaskan villages, he grew up close to nature, often making music outdoors, and “experiencing the devastating effects of climate change” firsthand, from melting sea ice to thawing permafrost. A desire to share the story of climate change through music led Burtner to develop two broad methodologies, which he described at AGU as “sound casting” and “sonic physiography.” He focuses his work in his home state of Alaska, where upwards of 95 percent of glaciers are thinning. 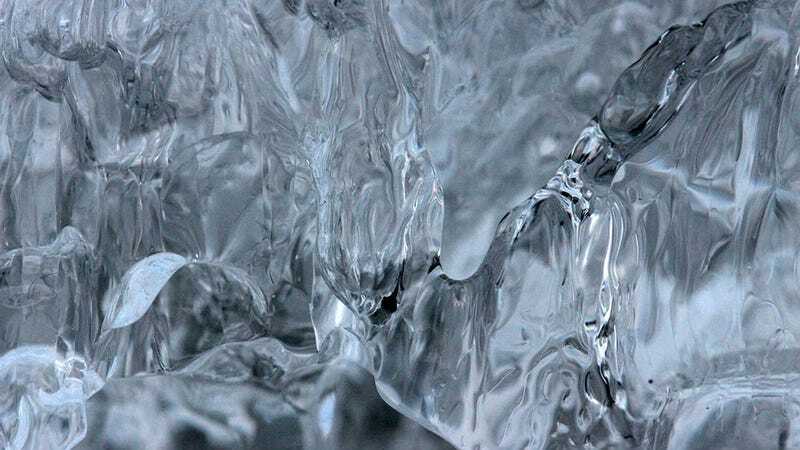 Sound casting collapses the vast spatial dimensions of Earth science data, allowing all of the noises associated with, say, a melting glacier—from the flow of water atop ice to the creaks and groans taking place within it—to be heard at once. Sonic physiography, meanwhile, alters the dimension of time, stretching it out or slowing it down to fit the wind or the rain or the flow of water from mountains to sea into a tempo that’s melodious to human ears. In the case of his glaciers, Burtner “time stretches” the sounds in order to pick out specific tonal signatures. For Burtner, both sound casting and sonic physiography start with collecting physical data—either by partnering with Earth scientists, or trekking out on the ice sheets himself. For a sound casting project based at Matanuksa Glacier near Anchorage, it’s the latter. “I’ve been monitoring the glacier for years, going out there and putting microphones down in the crevasses, inside the ice,” Burtner said. Each microphone is designed to detect a specific type of action on the ice, whether it’s surface runoff, deformation within the solid ice sheet, or flow in a subsurface channel. Of course, being an artist, Burtner doesn’t just leave it at that. After he’s got his sonic data assembled, adjusting space or time to create something that feels musical, he adds a layer of human interaction. “As we live in the Anthropocene, the things we do [to nature] are at least as significant as the changes happening in the natural environment,” he explained. To illustrate this, he’ll often include sounds of a person manipulating snow or ice in the composition. Burtner’s work—which has been performed in festivals and venues around the world, and even featured at former President Obama’s 2015 GLACIER conference on climate change in Alaska—is part of a growing trend of artists connecting Earth science with music. Earlier this fall, a Chicago-based art installation featured music made from seismic recordings of ice sheets in Antarctica. A string quartet at the University of Minnesota recently performed a piece is based off 133 years of NASA global temperature records. Last month, a group of artists and engineers rolled out plans for a tricked-out kayak that turns environmental data collected on the river into trippy beats. More and more Earth scientists are starting to see the value of music as a medium for communication, too. Also at AGU last week, University of Reading atmospheric scientist Paul Williams presented his research on the representation of weather and climate phenomena in music. He’s identified 25 classical music compositions and nearly 800 pop songs, written from the 1950s onward, that depict meteorological events in some way. He’s starting to analyze trends in the data. Songs written in the 1950s and 60s, which saw more severe hurricanes than the 70s and 80s, also had more mentions of storms, rain and bad weather. It’s just a correlation at this point, but “in the same way that we have a climatological record of temperature from ice cores, it seems there’s also a kind of climate record in music,” Williams said. Understanding that climate record could tell us something about how climate change will affect music in the future, too. For Burtner, blending music and climate science isn’t about the future so much as it is about connecting with people on issues that matter today.